Shor-Line was proud to be named as one of four finalists for the 2017 Governor's Exporter of the Year Award. The Kansas Department of Commerce selected the finalists and the final winner following an extensive review of the company's work in growing international business. "The Governor's Exporter of the Year Award proudly celebrates the successes of Kansas companies that excel in exporting and growing their communities," according to the department's news release. "It encourages the growth of the state's international commerce by showcasing successful exporters as role models to the Kansas business community. The recipients are prime examples of how exporting is a significant catalyst for company growth and diversification." The finalists participated in several presentations and site reviews. Shor-Line has been growing its global animal health product business for several decades, creating a strong presence in Europe, Canada, Mexico, Australia and Asia. 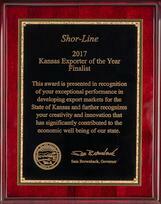 "We feel proud to be selected as a finalist and be recognized as one of the top Exporters in Kansas," said Rick Donahue, Chairman of the Board for Shor-Line. "It is gratifying to see the global demand rapidly growing for the Shor-Line brand. We take pride in our craftsmanship, and our quality products have developed a global reputation." Lee Aerospace of Wichita, Kan., won the Governor's Exporter of the Year Award for 2017 at a banquet presented June 6.